Google Translate helps users around the globe communicate with each other by offering tools capable of deciphering text, voice, and even photos of language written in a foreign tongue. And for all the app already does, late last year we got word that it was about to become even better, as Google gave it the ability to work its translation magic directly within other apps. Now not only is that feature finally ready to go live, but it's debuting alongside a couple other major Google Translate tweaks. 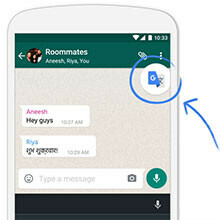 The new Tap to Translate mode integrates with Android's clipboard; simply copy foreign-language text to see the translation pop up right there in your current app – no swapping back and forth to Google Translate. The feature works with across all languages the app supports, and Google's quick to point out that it also supports offline mode. Which, as luck would have it, brings us to our next big tidbit of Google Translate news: offline mode has arrived for iOS. Now both iPhone and iPad users can download small language packs in order to keep translations going even where data connections are less than reliable. Only about half of the total number of languages supported by Google Translate are available with offline translations, but that still represents several dozen. Finally, Google's expanded its real-time Word Lens feature to now support Chinese; simply point Google Translate's camera at a sign or other printed text, and it will swap out any Chinese words it detects. Updates containing all these features start heading out this week. Although I admit that this is nice, I still can't see myself using Google Translate when there are tons of other translator apps that do a much better job that Google translate. Tons is a bit of an overstatement and I wouldn't use Gtranslate for translating letters or essays. For translating a few one-liners in a message app, it is more that good enough. The camera part is really amazing! I could really use it in them local Chinese restaurants :) The part of translating foreign text while in other apps, it just saves me the fraction of a second I take to switch back to my previous app on my OnePlus One (double-tap home button), other than that, Easy Copy has been offering this and many other time-saving tactics to me for quite a while now. Regardless, good update. i like wechat's translating system from chinese to english. Google should be something similar. Google Translate's "Tap to Translate" feature is not real tap to translate, because you still need to copy text to clipboard in pre-Marshmallow android, or select text in Marshmallow before you can tap to translate. There is an app that adds real "Tap To Translate" feature to Google Translate. Go to play.google.com/store/apps/details?id=com.vnspeak.​translate for more information.